One thing I've always liked about the Fundimensions line of Lionel trains is that you could count on them to be a lot like the Postwar originals. 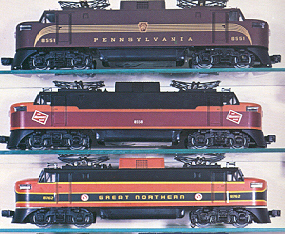 Although the diesel locomotives didn't always have the same features like Magne-Traction or sounds, a lot of them did have the means for retro-fitting those features into them. In the case of Magne-Traction, one needs the complete truck part to do this. These are available from many parts dealers. As for a horn, you'd be surprised that with the right parts, you can add this vintage feature to some modern equipment. 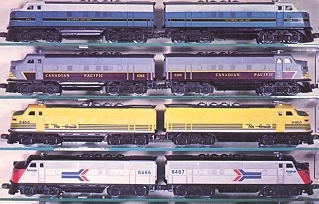 Diesels such as the F3, FM Train Master, and EP-5 Electric came with the same frame parts as the Postwar versions. In other words, these frames are tooled for installing the Postwar-style horns on them. The locos pictured all can have the battery-powered horns installed. Later versions of the F3s, starting in 1976, have modified frames that would make it difficult to incorporate a battery. Necessary parts for horn mechanisms are not to difficult to purchase from parts dealers. 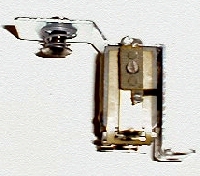 Reproduction horn brackets are readily available as are reproduction horns. Original DC relays can be found if you look. They run about $20 to $25. There are also new versions available designed to fit on the battery bracket in place of the original relay. You will also need to purchase insulating parts for the relay because the battery bracket carries the positive battery power to the horn. Please see appropriate diagrams for parts needed. 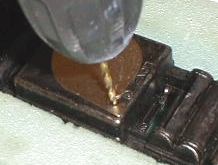 In the case of the F3s, the diecast frame is tooled for the D cell battery to fit in. This is the same frame as the 2243 Santa Fe F3 introduced in 1955. Designed for a single motor, 3-position E-unit, and horn, this was the same part used on the early Fundimensions F3s. At the back of the frame, you'll notice two small holes which are for the horn unit to be installed. 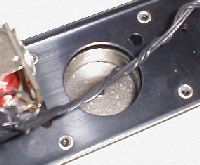 In the center of the frame, there are two small holes near the edge for mounting the battery bracket. In the center of the fuel tank, you'll notice the metal plug for the battery. This must be removed. It's in there pretty good so you will probably have to tap it out with a small hammer. A hole must be drilled for the fastening thumb screw. Looking inside the frame, you will see the raised Once the hole is drilled, use a 5/16" self-tapping screw to tap for the thumb screw. The diecast metal is soft enough that you shouldn't have much of a problem turning it. Modifying your F3 might be something you do not want to do. 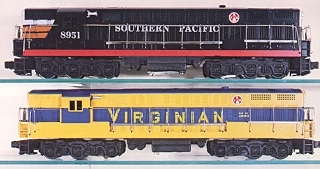 These models, even with their lack of features, are still fairly collectible. Some of the changes, such as drilling holes in the frame, are irreversible. The collectible value might decrease for some, even with the added horn. The FM Train Master is a lot like the F3. All the holes are punched out for mounting the horn and the battery bracket, but the diecast fuel tank needs two holes drilled for installing the battery cover plate. 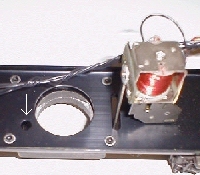 Note that there is an access hole in the frame in order to fasten the battery bracket to the fuel tank. What is particularly nice about adding a horn to this unit is that it has Magne-Traction and dual motors. Once you add a horn, it will be every bit as nice as the Postwar versions...for a lot less money. The EP-5 is a bit more complex. To install a horn in this locomotive, you'll also need to purchase a replacement diecast fuel tank part. These can be found with the battery cover plates already attached. It won't be too difficult to pop the plastic fuel tank off of the frame. On the Postwar EP-5s, the fuel tank is fastened to the frame by a press. I would recommend pressing four speed/lock nuts on the mounting posts. They will firmly hold the tank to the frame and if you ever want to remove the tank, you will be able to. Once the horn and battery bracket are installed on the frame, test the horn by inserting a battery and touching the horn lead to any part of the bracket. This is also a good time to adjust the horn for optimum pitch. When you solder connections to the relay, put the locomotive on the track and test the relay. Lionel 8950 FM. The fuel tank is basic same part as Postwar version. The metal plug in center must be removed. The Fuel tank is firmly secured to the frame at four points. Note the hole marked by arrow. This allows access to the battery cover rivet. The battery cover has a dimple that should be centered in the battery hole. 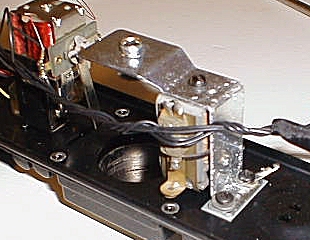 The slot end, not the hole end, of the battery cover should be placed in the right-hand corner nearest the E-unit lever. 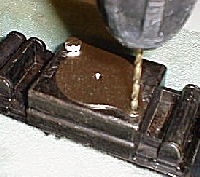 With the plate carefully centered, drill a hole for the lock screw. A self-tapping screw will perfectly thread the hole for the lock screw. With the cover plate secured to the tank by the lock screw, drill a hole in the other corner of the tank for the rivet. The relay should be secured to the bracket. The bracket with the relay is fastened down to the frame. The two screws are self tapping. Remember to include the insulation and two insulated washers. Refer to the separate wiring diagrams below on how to make electrical connections. The finishing touch is the label on the battery cover. I made this using an ink-jet printer. The text reads, "TO OPERATE HORN INSERT A SIZE 'D' CELL HERE, REMOVE CELL BEFORE STORING LOCOMOTIVE"
These basic steps will also work for modifying the F3 diesels. The EP-5 electrics will not require as much work. You'll gain a whole new appreciation for your early Modern Era locomotives as you run them and hear the blast of that unique Postwar monotone horn. For exploded diagram of the FM, which includes assembly of the horn components and wiring diagram, click here. For exploded diagram of the F3, which includes assembly of the horn components and wiring diagram, click here. For exploded diagram of the EP-5, which includes assembly of the horn components and wiring diagram, click here. *There really doesn't seem to be a difference between horn 2321-55 and horn 2367-55. They mount to the frames the same way for each locomotive. **The shoulder rivet is a more permanent and secure means of holding the battery plate to the frame. If you don't have access to a rivet press, use a small machine screw and nut to hold the plate one. Watch that it is always secure enough that it won't come apart on you from use. 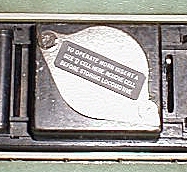 ***The underframe replacement part for the EP-5 generally comes with the battery plate already secured to it. They are diecast and sell for around $25.00. Original Lionel exploded diagrams courtesy of Jugle Archives.